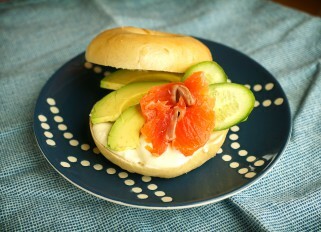 Perfect combination of cream cheese with horseradish, salmon, creamy avocado and crunchy cucumber. Instead of bagels you can use crackers or toast as well. Mix together the mayonnaise and cream cheese. Slice the cucumber and avocado, and cut the salmon into thin strips. 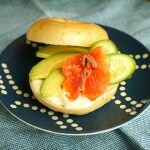 Spread the mix of cream cheese on one half of the bagel, and top with avocado, salmon and cucumber. Cover with the second half and serve or just serve open faced.